Current Leader None. Dissolved 28th February 2013 in honor and fulfilment of Prophecy of St Malachy (Moloch), Prophecy of Fatima, Prophecy of Kew and Covenant of One Heaven. The Roman Cult, also known as the Roman Catholic Cult of the Vatican was first officially founded in 1057 by chief pagan high priest of the cult of Magna Mater (Cybele) known as Gregory VII. The Roman Cult was never the legitimate leadership of the Catholic Church. However, through a relentless campaign to seize and consolidate its power, this relatively small band of individuals eventually controlled the destiny of over one billion good, Christian and ethical Catholics, who remained tricked into believing the legitimacy of the Roman Cult until the extraordinary act of honor of Pope Benedict XVI in dissolving it on February 28th 2013, to ensure the most significant of ancient prophecies and the restoration of the Universal Christian Church were fulfilled. Since the 1st Century BCE, its high priests known as "Pontiffs" -- a hereditary position controlled by a handful of ancient families -- claimed the ancient pre-Republic title of Pontifex Maximus after the Roman Emperors assumed themselves as high priest of the state cult of Magna Mater (Cybele). When Catholic Emperor Louis II died in 876, he left a power vacuum across the Frankish Empire. Catholic Pope Adrian II did not survive long after and the Papal States were once again thrown into turmoil. During this period, the various Lombard princes who had managed to keep their titles and lands by continuing to switch their allegiances between Byzantine, Muslim and Catholic invaders took it upon themselves to fight for the right to claim themselves Kings of Italy and Holy Roman Emperors. During this period, there were absolutely no Catholic Popes as the Tusculum pagan high priests of Magna Mater (Cybele) firmly established their claims and control of Rome. The first to break the deadlock between warring Lombard princes was Guy II of Spoleto. In a brilliant act, in 891 Guy convinced Formosus, the current pagan high priest (Pontifex Maximus) and ancestor of the Colonna to converting (at least in outward appearance) to being nominally Catholic as Popes, thereby being capable of crowning Catholic Kings and Emperors. Whether Formosus actually converted to being christian or not is still open for debate. What is certain is that by 892 in a grand ceremony in Rome, Guy was crowned King of Italy and Holy Catholic Roman Emperor by "Pope" Formosus. Neither the reign of Guy, nor Formosus were long as it appears he was murdered by other members of his fiercely pagan family of ancient priests no later than 896. The Vatican and the counts of Tusculum returned to their bloody pagan traditions until Pontifex Maximus Gregory VI (1045-1046) was captured and executed by the forces of Holy Catholic Emperor Henry III. Hildebrand (Gregory VII) was born in Soana (modern Sovana), a small town in southern Tuscany. He is alleged to have belonged to the noble Aldobrandeschi family, a sub branch of the greater Tusculum pagan priest family. In 1046, the forces of Holy Catholic Emperor Henry III invaded Italy and executed every last member of the Tusculum bloodline they could find - Gregory VI (1045-1046) being the last fully fledged pagan Pontifex Maximus of Rome. Following the massacre of the most senior satanic dynasty in all of Italy by Henry III, it appears Hilderbrand played an active part in communicating between the various Princely families fighting the various invasions of Catholic forces, Imperial Christian forces from Constantinople and Muslim forces up and down Italy. It was probably during one of his several visits to Pandulf IV of the powerful Princes of Capua at Benevento that Hilderbrand first came in contact with the Basque mercenary brothers of Robert and Roger Borja, otherwise misnamed as either Borsa, or Guiscard (which simply means sly and cunning). The Basques were ancient satanists, worshipping Mari -- the archetype for both the image of the Devil-Mendes and Lucifer. They also had a deep seated hatred towards Catholicism on account of Charles Martel and his descendents reducing their region to rubble (on account of their treachery in the first place). In 1056, Emperor Henry III died and his legitimate Catholic Pope Clement II was murdered soon after. It appears that Hilderbrand then enacted a brilliant plan to seize power. Recognizing that so long as the princely satanic families of Italy refused to be either Christian or Catholic, then Italy would continue to be over run by various invaders, Hilderbrand then offerred the Borja brothers a deal, that if they help him secure Rome and the alignment of the other princes, he would grant them and their descendents noble land and title. Thus from 1057, Hilderbrand named himself Pontifex Maximus Gregory VII in honor of the slain Tusculum satanic nobles and with the protection of the Spanish Borja mercenary brothers began reforming the satanic cults of Italy into the Roman Cult. The first and most significant innovation of Gregory VII was to call upon the fiercely pagan families in Italy to pledge in out appearance to being Catholic. The princely families of Italy had always known the Catholic Church was founded on a set of flimsy lies. But the military strength of the Catholic Empire was simply too strong. So instead of denying their lies, Hilderbrand convinced the princes to claim full belief in them as bonifide Catholics. This was critical to the success of his plan. Hildebrand planned to no less than assume full legitimate inheritance of the Catholic Church as a Roman Rite by claiming the Roman Pontiffs were always Catholic and that the Liber Pontificalus was in terrible error. Secondly, "Catholic" Pope Gregory VII instituted the second of his brilliant ideas -- the office of Cardinal and the College of Cardinals. 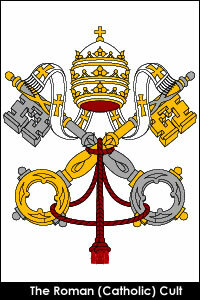 To reinforce his claim that the Romans were in fact the legitimate heirs of the Catholic religion (created less than 300 years earlier), he introduced the office of Cardinal whereby (as in ancient times), each family would be permitted to have no more than one of their family members as a Cardinal. Thereafter, the office of Pontifex Maximus would be elected from this select group. Thirdly, Gregory VII formalized the process of land and title, ending centuries of bitter feuds between various princes by ensuring the process of noble title would be regulated through the College and the Pontiff known as the "Curia". Thus the Roman Cult and the base of their power was born. Gregory further introduced innovations to reinforce the myth that the Latins had "always" been Catholic by introducing new forged texts such as the Dictatus papae -- a compilation 27 axiomatic statements to claim not only that the Latins were always Catholic but to begin to indoctrinate the heretical demonic doctrine of Cybele into the liturgy of the Catholic Church. Gregory went even further, ensuring that Cybele now became Mary, Mother of God --and technically superior to Jesus -- as official "doctrine" of the Catholic Church. While this terrible heresy was against both Christian and Catholic doctrine, within two hundred years, it would actually become official Catholic doctrine under the control of the Roman cult. However, by 1083, King Henry IV was ready to invade Italy and by 1084 Gregory was captured along with his family and immediately executed. However, the diplomatic innovations and restructuring of satanic beliefs and human sacrifice into a parasitic "catholic" belief system would outlast him. His legacy is the Roman Cult and its unyielding hostage of the Catholic Church today. In spite of the innovations of Gregory VII, if not for the Princes of Capua, the satanic worshipping Benevetans, then the Roman Cult may simply have fragmented into history. It was Zotto de Landalf, otherwise known as Peter the Hermit and the "great" Pope Urban II who through an act of utter madness and military genius, secured the long term survival of the Roman Cult. In 1084, a massive force of 36,000 finally broke the siege of Roman Cult Leader Antipope Gregory VII in Rome who had been protected by the mercenary army of Basque native Robert Borja (the Guiscard--which means "sly, crafty"). Robert Borja managed to escape with some of his men, but Antipope Gregory VII was not so lucky and was promptly tried, excommunicated and executed as a heretic of the Catholic Church. Robert Borja then fled to Benevento and the father of Zotto, who promptly claimed himself Pontifex Maximus as the heretical Roman Cult AntiPope Victor III (1084–86) against the reign of the true Catholic Pope Clement III (1080, 1084–1100). The elite Norman troops of Henry IV then beseiged Benevento until finally the well fortified city fell in 1086/7 and AntiPope Victor III along with Robert Borja were executed as heretics against the Catholic faith. Zotto and the few remaining Roman Cult priests along with the remnants of the Borja mercenary army managed to escape and around 1086 they named Zotto as the new heretical AntiPope Urban II -- Pontifex Maximus of the Roman Cult. A hunted man, supported by only a handful of loyal mercenaries, all might have been lost for antiPope Urban II if not for his bold and audacious strategy. Firstly, Urban completely changed his appearance into that of a poor hermit, calling himself Peter. Next, he began to rally support, not just from nobles but from common people on the notion of stories of horror and torture by the Byzantine Emperors against "good christians" as well as vast treasures kept in their vaults. As proof, Urban used the seized booty and trinkets taken by Robert Borja from the Byzantines in Sicily. So brazen had antipope Urban become in his disguize as a holy man "Peter the Hermit" that he travelled as far as the Council of Clermont to plead his case for a Holy Crusade. Following the final and complete destruction of the Holy Roman Empire by the heretical Roman Cult armies in the 15th Century, the history of this 1st Crusade was changed to claim the target was Jerusalem and the Muslims -- a complete and utter lie. The target was always the capture of Constantinople and to outflank the Catholic Church by seizing the most damning library of evidence in the world against this religion established in 741- The Imperial Archives of Constantinople. Brilliantly using the Catholic doctrine against itself, by 1095 antipope Urban had amassed a large enough rag-tag army to begin their march eastward into the ancient territories of the Holy Roman Empire. By 1096, Urban and his army had beseiged and overwhelmed Belgrade, slaughtering hundreds of thousands of innocent Christians along the way in arguably one of the greatest bloodbaths in history. The sheer terror his army wrought was enough to empty towns in his way so that in the same year (1096), the heavily fortified Constantinople fell relatively easily. Urban immediately ordered the Imperial Archives to be removed back to his Italian base with much of Constantinople burned. In all Urban's army slaughtered over 50,000 people in Constantinople alone. Strengthened by his success, Urban now moved on to the capture of Jerusalem. Over confident, he moved across Turkey, Syria and down to Antioch killing tens of thousands more Christians along the way. However, the Muslims retaliated and Urban found himself beseiged in Antioch in 1098-- cut off from the rest of his army. It is said Urban continued to demonstrate extraordinary oratory skills of persuasion during the seige convincing starving and injured Crusader militia they could defeat a superior and better disciplined Muslim enemy- which they failed to achieve. He was caught and beheaded by the Muslims at the end of the seige in 1099. In retaliation, his son antipope Theodoric rallied the army and took Jerusalem in the same year. Once the Roman Cult of reformed satanists had the original documents forming Christianity and the Holy Roman Empire in their possession, it was only a matter of time before a truce could be forced to ensure the Roman Cult could maintain its parasitic control over Catholicism. This event occurred at the Concordat of Worms in 1123 between Roman Cult leader Callixtus II and Holy Catholic Emperor Henry V.
Ever since, the Catholic Church has been held hostage by these small band of families, who continue to hold the reigns of real power. Year by year, century by century the original doctrine of both Christianity and Catholicism has been replaced with the heretical and evil doctrines of the Roman Cult--with Christianity helpless to stop them. Even the great reformation movements did not seek to address the fundamental issue that so long as lies have been told in the formation of the religion, then the Roman Cult has been able to use those lies to twist the more important doctrine of faith. The following is the most accurate list to date on the Roman Cult AntiPopes since the formation of the false Christian Cult under Gregory VII. * All Popes since the 16th Century until March 14th 2013 have been members of the Roman Cult. In accord with the ancient fulfilment of prophecy of Revelation, the prophecy of St Malachy (Moloch), the prophecy of Fatima, the prophecy of Kew and the most sacred Covenant of One-Heaven (Pactum De Singularis Caelum) all living and deceased officials and previous members of the Roman Cult including Cardinals, Bishops, Deacons and Ordinaries are granted Divine Redemption including the Sainthood of all Popes , including the ratification of the Treaty of the Divine Masculine, the Treaty of the Divine Feminine, the Treaty of the Divine Apostles, the Treaty of Angels, Saints and Demons and the Treaty of Spirit States and the end of Hell and Damnation forever from the Day of Divine Judgment on GAIA E1:Y1:A1:S1:M9:D1 also known as Fri, 21 Dec 2012.